To subscribe or unsubscribe, email info@PathologyOutlines.com, indicating subscribe or unsubscribe to Case of the Week.� We do not sell, share or use your email address for any other purpose.� We also have emails for new Pathologist jobs (biweekly), new other Laboratory jobs (biweekly), website news (monthly), new books (monthly), and a newsletter (twice a year).� You must subscribe or unsubscribe separately to these email lists. 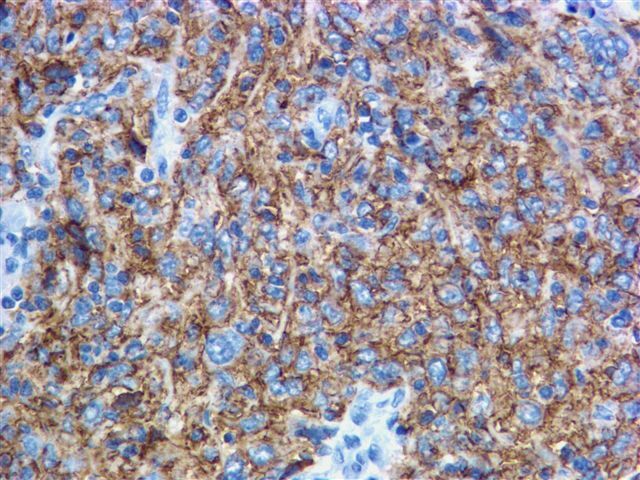 This case is sponsored by Vision BioSystems, whose fully automated Bond� system is improving the quality and workflow of IHC and ISH staining.� With complete automation and specially developed reagents (including ready-to-use antibodies), the Bond system eliminates unnecessary manual handling and ensures consistency at every step. Bond also has a unique continuous processing capability with three independent slide trays.� This allows laboratories to start slides as soon as they are ready while retaining capacity to add more slides at any time.� Continuous processing ensures stained slides are ready exactly when they are needed. Bond is part of Vision BioSystems� Lean Histology� range and it is ideal for laboratories pursuing Lean and six sigma principles.� For more information on the Bond system, visit our website www.vision-bio.com. We thank Dr. Julia Braza, Beth Israel Deaconess Medical Center, Boston, Massachusetts (USA), for contributing this case and the discussion. We invite you to contribute a Case of the Week by emailing info@PathologyOutlines.com with microscopic images (any size, we will shrink if necessary) in JPG or TIFF format, a clinical history, your diagnosis and any other images (gross, immunostains, EM, etc.) that may be helpful or interesting.� We will write the discussion (unless you want to), list you as the contributor, and send you a check for $35 (US� dollars) for your time after we send out the case.� Please only send cases with a definitive diagnosis. A 36 year old man was admitted to an outside institution with a one month history of nausea, vomiting, diarrhea and abdominal pain. �He also had a 30 pound unintentional weight loss, anorexia and fatigue.� He did not experience early satiety, dysphagia, increase in abdominal girth or hematuria, urinary frequency or rash.� His past medical history included a cholecystectomy. The physical exam was entirely within normal limits, with no palpable abdominal mass or lymphadenopathy.� Laboratory tests included WBC 17.6, hematocrit 43.8% and platelets 513K. 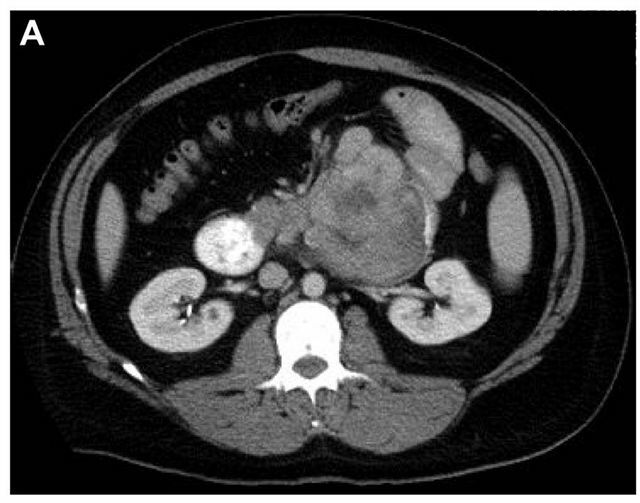 �The electrolyte panel was within normal limits.� An abdominal CT scan demonstrated a large mass arising from the distal third of the duodenum, with intra and extra-duodenal components (Figure 1).� There was mild dilation of the proximal duodenum, suggesting obstruction.�� Radiologically, a gastrointestinal stromal tumor (GIST) was strongly considered in the differential diagnosis, because of the size and location. The patient underwent an en-bloc resection of the tumor, partial pancreatectomy, and abdominal and regional retroperitoneal lymphadenectomy. 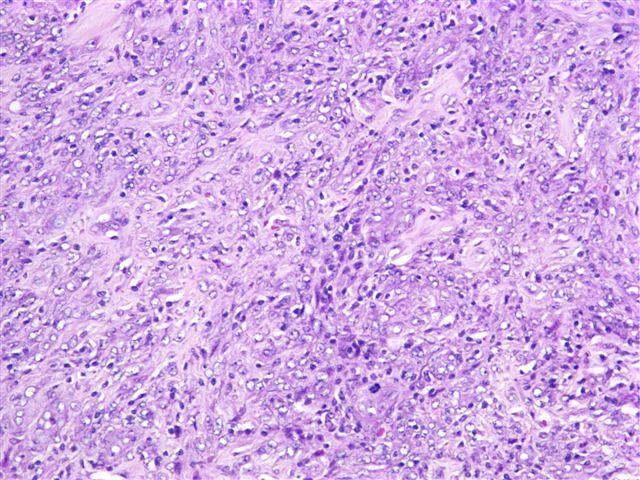 Follicular dendritic cell sarcoma is a rare neoplasm, characterized by Monda et al in 1986 7.� It usually occurs as a painless, indolent mass.� The median age of patients is in their fifth decade, with an age range of 17-76 years 5, and no gender preference.� Patients with abdominal involvement may present with pain, but there are usually no constitutional symptoms.� It may be associated with Castleman�s disease-hyaline vascular type 5, either preceding the sarcoma, or growing separately.� It usually involves lymph nodes 3, predominantly cervical, axillary or mediastinal.� Extranodal sites include oral cavity, spleen, liver, small intestine, pancreas, peritoneum, soft tissue, and skin.� Splenic and hepatic tumors are associated with Epstein Barr virus 1, 6. 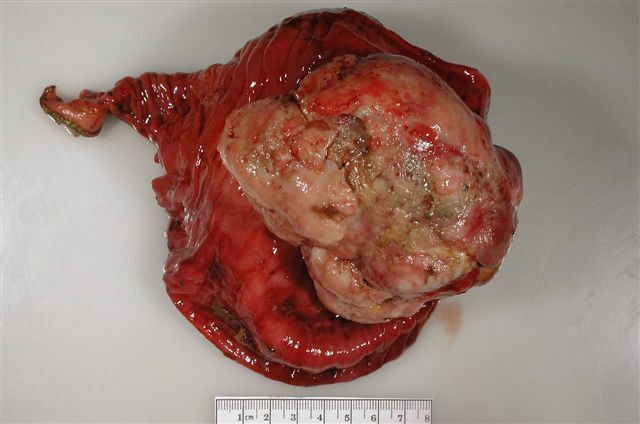 These tumors typically recur locally, with occasional distant metastases to liver or lung.� In a review by Fletcher et al., it appeared that large tumor size (6 cm or more), intraabdominal location and coagulative necrosis were associated with a higher rate of recurrence, metastasis, and mortality 2. These tumors are likely to be misdiagnosed unless one thinks of them and tests for follicular dendritic cell markers (CD21 and CD35).� The main clinical and pathologic differential diagnosis, particularly within the abdomen, is a gastrointestinal stromal tumor (GIST).� GIST and follicular dendritic cell sarcomas share some histologic features, including the fascicular arrangement of spindle cells, the frequent presence of epithelioid cells 4, and occasional S-100 reactivity.� However, GISTs are uniformly c-kit positive and usually CD34 positive. 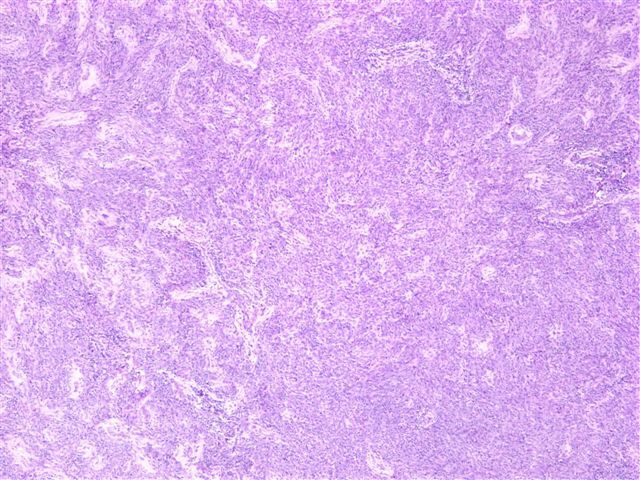 The differential diagnosis also includes fibroblastic reticulum cell sarcoma (vimentin+, smooth muscle actin+, desmin+, CD21-, CD35-), interdigitating dendritic cell tumor (S100+, vimentin+, CD21-, CD35-), melanoma or other sarcomas. 5. Ioachim HL, Ratech H.� Ioachim�s Lymph Node Pathology.� Philadelphia: Lippincott Williams & Wilkins, 2002: 490-95. 6. Jaffe ES. 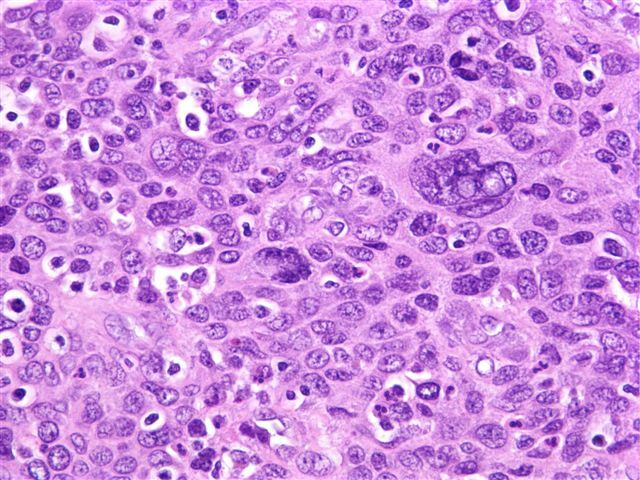 Histiocytic and dendritic cell neoplasms.� Follicular dentritic cell sarcoma / tumor. In: Jaffe ES, Harris NL, Stein H, Vardiman JW, eds.� Pathology and Genetics of Tumours of the Haematopoietic and Lymphoid System.� Lyon, France: IARC Press; 2001; 286-288.� World Health Organization Classification of Tumours; volume 3.